Westone Model 4RT motorcycle ear plugs are designed primarily for motorcyclists to wear under a helmet to help eliminate wind noise, but still let you hear the traffic sounds you need to remain aware of. 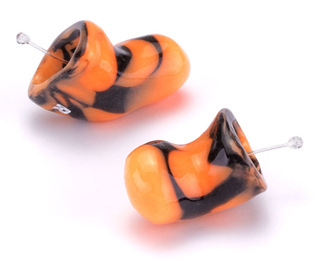 Made of soft otoblast silicone material, and featuring a hollow canal style, Westone Model 4RT motorcycle ear plugs are extremely comfortable, even after hours of cross country cruising. The low profile, canal style earpieces mean the Model 4RT ear plugs will not interfere with your helmet, and each ear plug has a handy removal filament that makes removal a snap. Westone Defendear Style 4RT Motorsport Custom-Fit Motorcycle Ear Plugs (One Pair)5MikeOctober 3, 2018Process went smoothly after we re-read the instructions. The ear plugs are amazing. Better than I had hoped for in terms of performance and comfort! Westone Defendear Style 4RT Motorsport Custom-Fit Motorcycle Ear Plugs (One Pair)4MikeJune 18, 2017Have had these for about nine months and they work very well over about 15,000 miles on the bike. The only problem, is that the fishing line has broken out of both of them. For the price, I feel this should not have happened. Westone Defendear Style 4RT Motorsport Custom-Fit Motorcycle Ear Plugs (One Pair)5NickMay 5, 2012The whole process went very smoothly. Made the impression with the help of my wife. Waited couple of weeks and got the ear plugs. Needed my wife's help to figure out which one went to which ear and in what position. Then used it on a bike ride and really loved it. Better than any other ear plug I used in the past.